Detailed Coverage of Delaware, Maryland, West Virginia, Virginia, Kentucky, Tennessee, North Carolina, South Carolina, Louisiana, Mississippi, Alabama, Georgia, Puerto Rico and Florida. 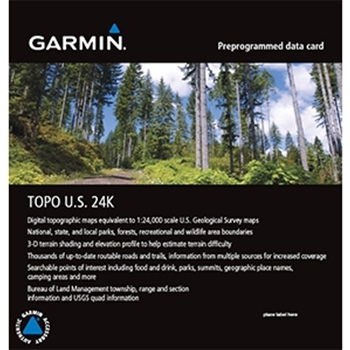 Garmin's TOPO U.S. 24K Southeast microSD/SD brings you the highest level of topographic detail available, with maps comparable to 1:24,000 scale USGS maps. These highly detailed maps on microSD/SD include terrain contours, topo elevations, summits, routable roads and trails, parks, coastlines, rivers, lakes and geographical points — and they also display 3-D terrain shading on compatible devices. With routable roads and trails in metropolitan and rural areas, getting to your destination is easy by creating point-to-point routes on compatible units.